Access to adequate toilets is essential to enable children to go to school. Bad hygiene and poor sanitation are major contributors to the prevalence of water-borne sickness and diarrheal disease. The Kpogede Community is located in the Volta Region of Ghana. Families here had limited access to sanitation facilities. The area has a high prevalence of water-related diseases including schistosomiasis (parasitic worms), cholera and diarrhoea. These were particularly affecting young children. Kpogede Community School was lacking basic facilities with only two toilets (used by over 300 students), no handwashing facilities and no changing rooms. The lack of facilities meant that many children would go to the toilet in the school grounds. Not only is this unhygienic but open defecation put the children and teachers at high risk of diarrheal disease. 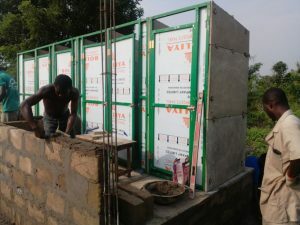 In 2016 we worked with Kpogede Community School to build a toilet block for the students, handwashing facilities, and changing rooms. We also supported the school to implement a hygiene awareness programme as part of the school curriculum and a community education programme to equip local families with safe hygiene and sanitation practices. With these improved facilities and educational programmes, the risk of water-borne diseases will be minimised and provide safe and clean sanitation facilities and practices for all the children at Kpogede Community School and in the wider community.